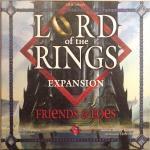 Description: This expansion to the Lord of the Rings board game adds two new scenario boards (Bree and Isengard), 13 new feature cards and 3 new Gandalf cards. It also adds two completely new features to the game: Foe cards which add a major new aspect to the game; and Character Ability cards which give each character a unique one-shot ability. A small 4 card package. Given away free at cons/fairs or gamestores. Freely printable from the Reiner Knizia Cool Stuff webpage or the files section below.